So when does a group of restaurants with the same name and same menu not be classified as a "chain restaurant"? Think of it though, all chain restaurants started out as one location and due to their popularity have expanded to several more. The best example locally would be Cactus Club and White Spot. Now, those 2 are in the later expansion phase while some others are just beginning to multiply. 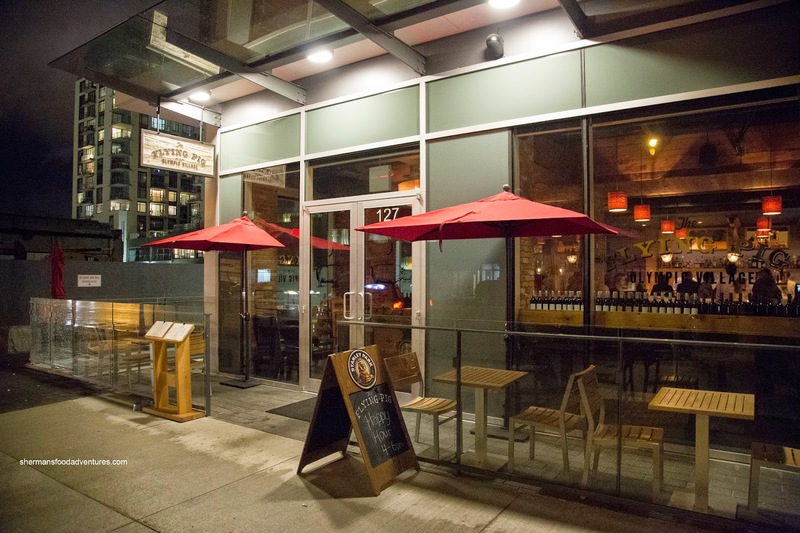 One of which is The Flying Pig with locations in Yaletown, Gastown and recently in Olympic Village. We decided to check it out after hockey one night. Since I didn't have dinner, I went for a hearty dish in the T.F.P. 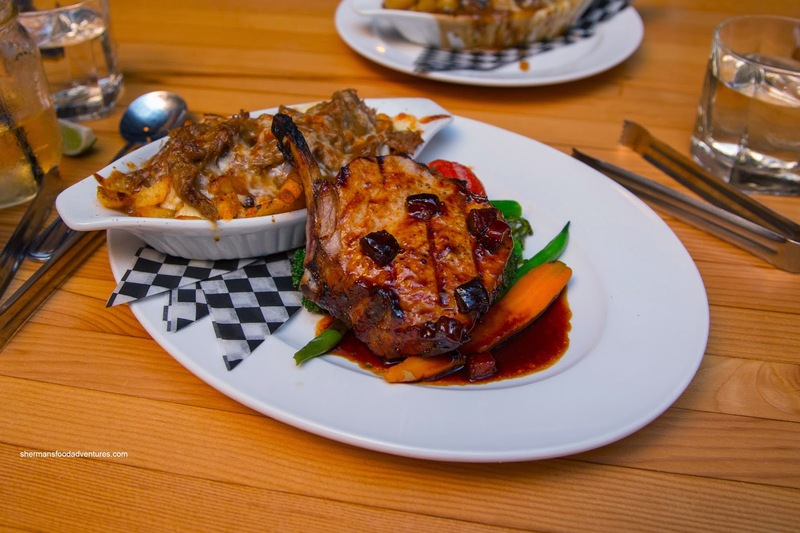 Signature Pork Rack with pulled pork poutine and apple cider reduction. Although thick, the pork chop was succulent throughout while still sporting a nice char on the surface. I thought the cider reduction was mildly acidic and slightly sweet with bits of bacon. I enjoyed the dish, but would've liked to see the pork brined to give an extra punch of flavour. As for the poutine, some of the fries were still crispy even though there was a significant amount of moist pulled pork on top. I liked the sharpness of the ample cheese, but overall, the dish was rather salty. 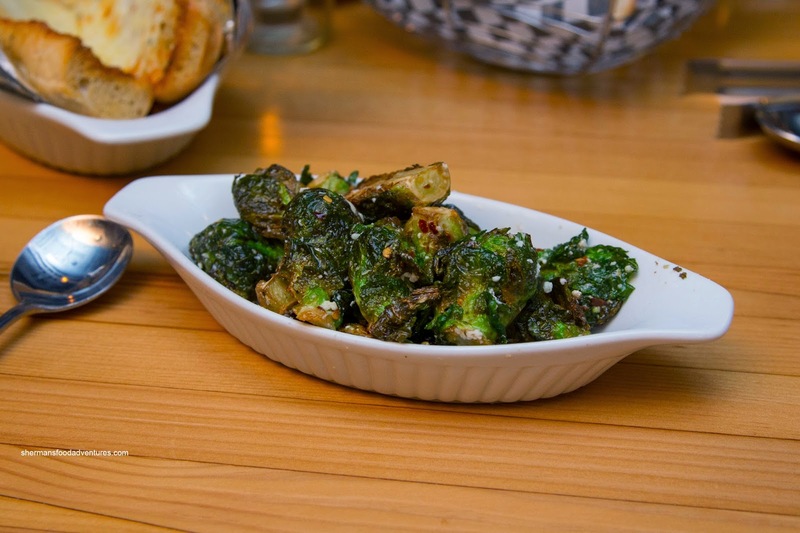 Milhouse, Emilicious and myself shared 3 sides including the Crispy Brussel Sprouts spiked with lemon, Parmesan and capers. If I had to compare, these were less fried than the ones found at the Glowbal Group where the inside retained some brussel sprout texture. I enjoyed the plethora of acidity in addition to the saltiness of the capers. 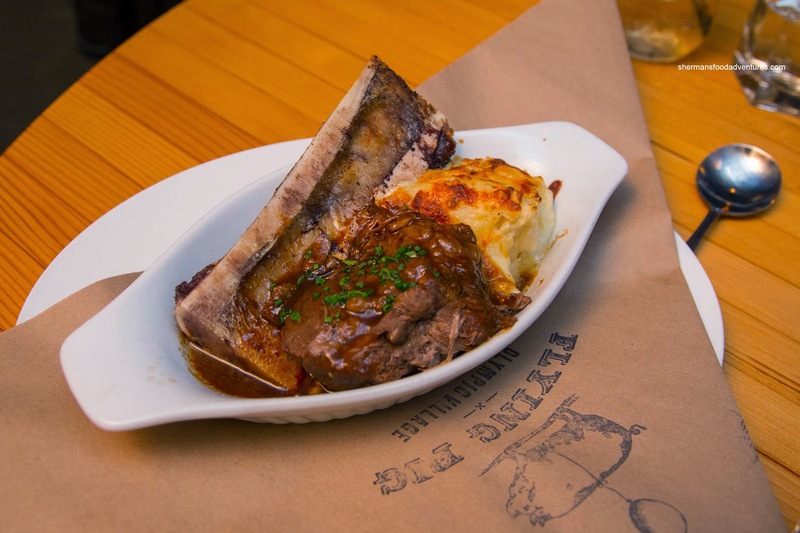 Emilicious went for the Red Wine Braised Short Rib with roasted bone marrow and aged white cheddar mash. 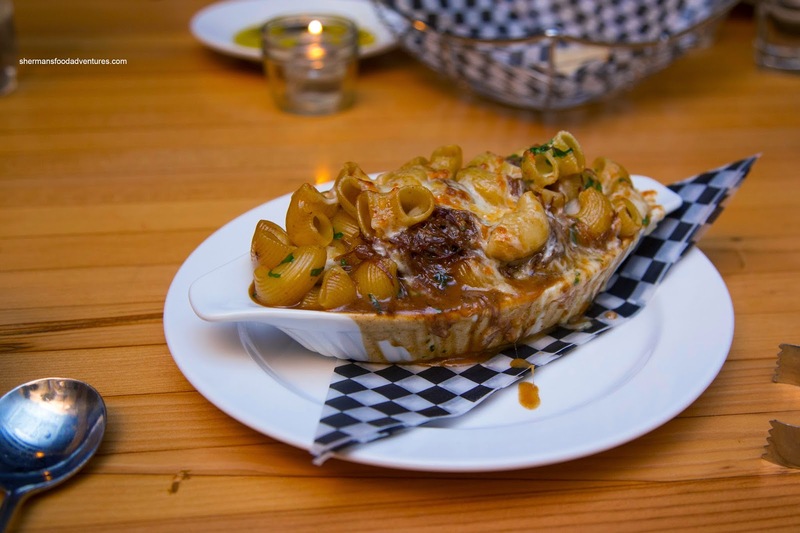 I've had this dish at the Yaletown location before and despite not looking like a whole lot, it is pretty rich and filling. It was no different this time around where the bone marrow was fatty and decadent while the short rib was mostly moist while sporting a natural meat essence. The starchy mash was well-seasoned with the aroma and background sharpness of the aged cheddar. Continuing with the bone marrow theme, we had the Bone Marrow Cheesy Bread which was covered by a significant amount of melted cheese. Now, the cheese was evident visually and texturally, but the bone marrow as not very apparent. The fatty aroma was just not there. 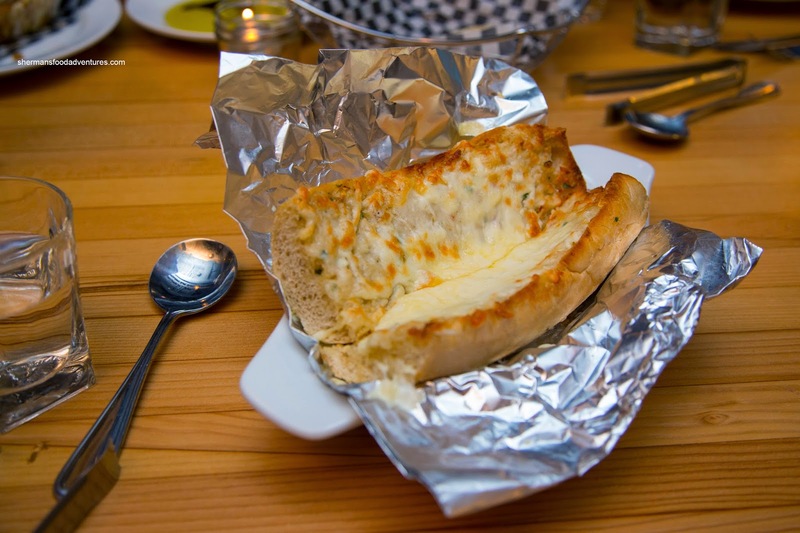 With that being said, this was still a very good cheese bread. Milhouse decided on the Veal Piccata with Parmesan risotto and lemon caper butter. 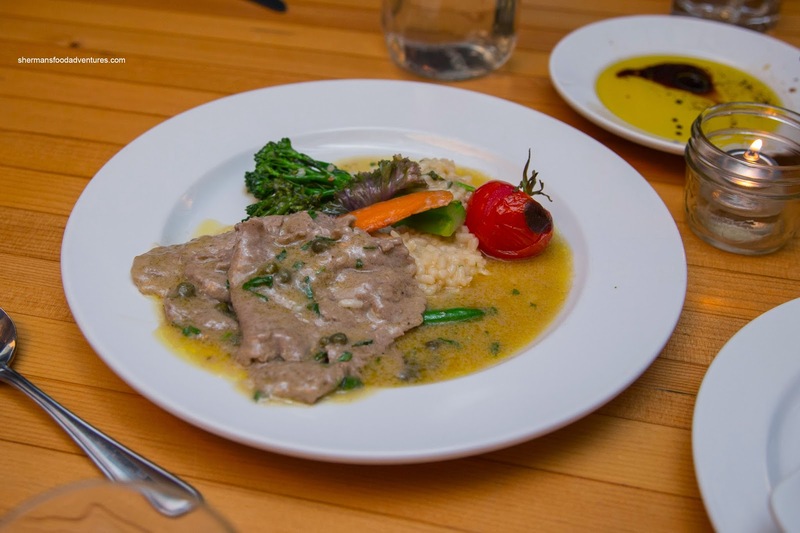 The thin slices of veal were buttery soft while retaining a tender meatiness. I thought the lemon caper better was well-balanced and clean. There was a purposeful amount of acidity to go with the saltiness of the capers. The veggies were also on point being vibrant and barely done. A touch soft and not really that creamy, the risotto was acceptable but not memorable. Our last shared side was the enormous Jumbo Shortrib Macaroni with Cabernet cream sauce. For $9.50, this could've easily passed for an entree as it was chock full of tender shortrib bathed in a sauce that was creamy and meaty with the added sharpness of melted cheese. The choice of pasta was spot on as it was big enough to withstand the moisture while being able to retain sauce. 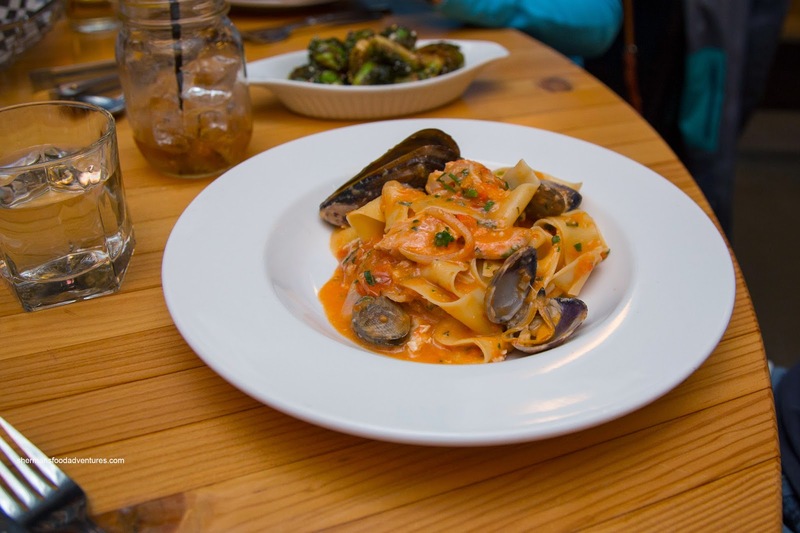 Gadget Girl and Groundskeeper Willy both had the Wild Seafood Pappardelle with mussels, clams, fresh fish, prawns in a spicy rose sauce. The big sheets of pasta were a touch soft while the creamy sauce was balanced except missing the promised spice. There was a decent amount of well-prepared seafood which made this dish decent, yet probably the weakest of the meal. Despite this, we enjoyed most of the dishes we ordered. Considering the price point and general portion size, The Flying Pig serves as a pretty good alternative to the more established chain restaurants.